Is The Giant Transocean 'Plane Coming? FOR years past, German aeronautical circles have been discussing the plans of Dr. Rumpler for the construction of a giant all-metal flying ДальшеMore>>> boat, meant for transocean service. All details of the design have been completed in ten years of consistent work, and innumerable have been the model tests and calculations carried out simultaneously with the design work at the famous Aerodynamical Institute of Gottingen, and at the Shipbuilding Institute at Hamburg. Dr. Rumpler has had the somewhat unusual satisfaction of leading German aeronautical experts of international repute giving excellent opinions on his new design after carefully studying it from all aspects. In spite of the decidedly good reception of Dr. Rumpler's ideas, it was not possible to find the necessary financial support in Germany for the construction of the 'plane. Dr. Rumpler therefore turned to America for aid, and now appears likely to receive it there, for he has been invited to the United States for preliminary negotiations by a group of financiers. If these negotiations are successful, Dr Rumpler proposes to construct the aeroplane in Germany, where the building costs would be lower than in America, and the company which is to be founded for the construction is also to operate the 'plane between Europe and North America. 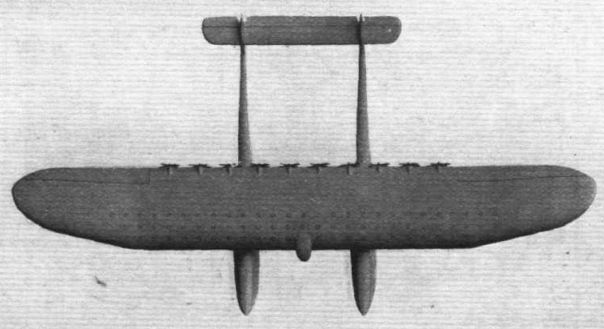 The design of Dr. Rumpler's giant 'plane is protected by far-reaching patents in all countries, its main characteristic being that the load and all heavy parts, such as the engines, are distributed evenly over the whole wing surface, so that each sector of the wing carries directly a portion of the entire weight. That is, the load is decentralised. It is a well-known fact that it is impossible to increase the size of 'planes of normal type without sacrificing a disproportionate amount of the carrying capacity. The reason is that the wing spars have to be made exceedingly strong to withstand the bending strains arising from a centralised load. 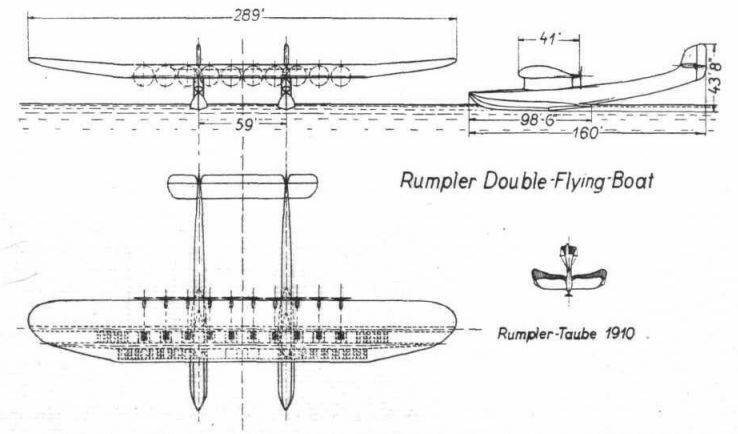 This is of tremendous importance, and German experts have calculated that a 'plane of the same size as the one planned by Dr. Rumpler, but built along lines to-day considered normal, would weigh anything between 8 and 10 tons more. The machine is of the cantilever monoplane type, and the wing, resting on two hulls, contains the engines and the accommodation for the passengers and crew, whilst the petrol is located in the hulls. The adoption of two of the latter secures great lateral stability on a rough sea, and with a side-wind blowing. The wing is built up of steel tubes braced by flat aluminium rods, and constitutes a single rigid structure, which is covered with a skin of duralumin. The total span amounts to 289 ft., with a chord of 41 ft. The tips, to a distance of approximately 58 ft. at each end, are slightly turned up and carry inside some auxiliary petrol tanks, which, however, are right away from the engines, as also from the passengers' and crew's quarters. The middle section of the wing is perfectly level, and has a length of 173 ft. The plan shape is rectangular, whilst the leading edges of the wing tip sections retreat. The wing tips are rounded off and merge into the ailerons, the trailing edges of which are level with the rear edge of the central wing section. 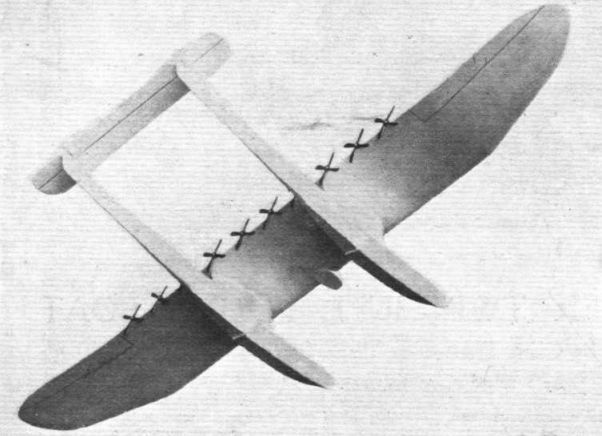 The ailerons are as long as the upturned part of the wing ends. The maximum height of the central section is 8 1/2 ft. This tapers towards the tips from the upward bend onwards. The tubular framework of the wing is so arranged that there are two especially strong girder spars passing down the entire span of the wing. The rear one lies 21 ft. back from the leading edge, and between the two are mounted 10 engines, with an output each of 1,000 h.p. These engines are distributed evenly over the 173-ft. length of the central wing section, and are connected by means of long shafts with 10 four-bladed propellers arranged along the trailing edge. In front of the engines is a gangway 3 ft. broad and having 7 1/2-ft. headroom. On each side of this gangway, extending over the whole span of the wing, is a partition with noise damping lining, and located in front of the forward partition are the passenger cabins. These are commodious, and contain six seats each, the measurements coinciding with the German railway standards for first-class accommodation. The crew's quarters, kitchen, etc., are located left and right of the engine room, while the navigation cabin projects forward from the centre of the leading edge. Adjoining behind are the chart and wireless rooms, as also the officers' quarters. Altogether, the wing holds accommodation for 135 passengers and 35 officers and men. besides ample room for cargo, mail and luggage. The two hulls each have a length of 160 ft., of which 9 1/2 ft. are submerged when the 'plane is in the water. The hulls are attached to the wing by means of streamlined turrets with doors leading out on the hull decks and having stairs inside leading up to the wing. The shape of the hulls has been carefully worked out with the aid of innumerable towing tests of models at the Shipbuilding Institute, of Hamburg. The bottom transverse section of the hulls in their forepart has a flat V-form and gradually develops into two successive steps towards the rear, where, coming out of the water, the hull sweeps up assuming an oval section, which constantly grows flatter and at the end forms a large vertical fin carrying the rudder. The keels of the two hulls are 59 ft. apart, and their tails are joined by a large stabilising surface extending left and right of the rudder fins and carrying on the rear edge three elevator surfaces. Like the wing, the hulls are constructed of steel and duralumin. As already mentioned, the hulls carry the main petrol tanks, which are arranged so that they can be inspected, gangways for this purpose being provided. The hulls also carry such equipment and accessories as anchors, ropes, etc. The whole 'plane fully laden ready for flight is calculated to weigh 250,000 lb., of which 143,000 lb. are useful and 44,000 lb. paying load. Besides 170 persons, it will be able to transport 13,000 lb. of mail or cargo. It is hoped to attain a cruising speed of 185 m.p.h. with it, which appears very probable in view of the fact that air resistance is reduced to a very great extent by the engines being located inside the wing and no struts and wheels being exposed to the air current. The take-off speed, it is estimated, while the ship will come down on the water with a speed of approximately 55 to 56 m.p.h. It is intended to fly the 'plane normally at an altitude between 8,000 and 13,000 ft. The peak will probably be somewhere around 16,500 ft. The total lifting area of the wing is 10,764 sq. ft., so that fully-laden the wing loading would amount to 23 lb./sq. ft. The 'plane will be able to fly a non-stop distance of 3,700 miles, the fuel consumption being assumed as that now normal in standard aero engines. Dr. Rumpler, by the way, hopes ultimately to be able to use Diesel engines, as these work more economically, while at the same time the heavy fuel means reduced fire risks. Experience with propeller-shaft transmission for such high-power outputs is lacking in aeroplane work. The Junkers G 38 has such a type of transmission. But the shafts are very short and the engine output is much lower. The propeller-shafts of Dr. Rumpler's ship will have to be about 20 ft. long and this appears the only real difficulty in the whole design. Dr. Rumpler has designed a special transmission, incorporating large diameter hollow shafts running in self-aligning ball-bearings, and having flexible couplings at each end. Their weight is of no very great account when it is considered that engine trestles above the wing or nacelles below it fall away in this design so that their weight is saved. The 10,000-h.p. output of the engines comprises a big reserve, for the 'plane is capable of flying with less than 7,000 h.p., even when fully laden, at an altitude of 13,000 ft. At the beginning of the flight the power reserve amounts to 31 per cent., so that the 'plane could continue flying even if three engines fail. That is at 13,000 ft., and when going down to 3,000 ft., the power reserve would amount to as much as 40 per cent. As the machine becomes lighter the longer it flies, owing to the fuel consumption, the degree of safety constantly increases and reaches 60 per cent, towards the end of the flight. Dr. Rumpler has made up an interesting chart, demonstrating the behaviour of the 'plane in the event of a number of engines failing in succession. Supposing the 'plane is flying along at 13,000 ft., and no fewer than four engines stop work before the first 300 miles have been traversed - surely, very pessimistic! - the machine will then sink down to 8,000 ft., and again gradually climb up to 11,500 ft. before a distance of 620 miles is reached. If now a fifth engine were to fail, the 'plane would sink to 5,000 ft. and again rise to 11,500 ft. by the time it has traversed 1,500 miles, and now even a sixth engine could stop without impairing the safety of the 'plane or necessitating its going down on the water. After once more sinking to 5,000 ft., it could again climb to 8,000 ft., working with only the remaining four engines. Such a large number of engine failures are scarcely ever to be expected since it is possible to repair the engines, which are very well accessible on all sides inside the wing, during flight. Thus, the matter of safety appears very well cared for.